A clustering of planets in early morning twilight. From Abrams Planetarium Sky Calendar All similar diagrams (c) Abrams Planetarium, 2011. Used with Permission. Key for these diagrams: Me, Mercury; Ve, Venus; Ma, Mars; Ju, Jupiter. 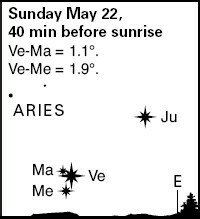 The charts above show the planets on May 1 and May 2 at around 5:20 a.m. CDT in Chicago. On May 1, a thin crescent moon appears to the left of Venus. With binoculars or telescope locate Mars and Jupiter beneath it. The next morning, the moon is much lower, although the planets are visible again low in the eastern sky. This clustering of the planets is from a seemingly complex motion of the four planets and Earth. Mercury is the fastest planet, revolving around the sun in 88 days, although it catches up to Earth and passes our planet every 115 days. That’s three times every year. Venus revolves through its solar orbit every 224 days, but it takes 584 days (1 year, 7 months) to catch our moving planet. Mars revolves around the sun slower than Earth, taking 1 year, 292 days for one solar revolution. Our planet catches Mars every 2 years, 51 days. The fourth planet moves slowest. At its distance from the sun, Jupiter takes nearly 12 years to revolve around the sun and our faster moving planet catches up to and passes Jupiter in one year, one month intervals. On April 9 Mercury passed between the earth and the sun and emerged into the morning sky. It climbed higher into the morning sky. On May 7, it reaches its greatest separation (elongation) from the sun as seen by Earth. Venus has been in the morning sky for several months and it is slowly disappearing in the sun’s glare as to moves behind the sun on August 16. As the days and weeks, pass Venus appears lower in the sky until it disappears in the sun’s brilliant glare. Mars appears to be emerging from behind the sun as our planet’s faster motion carries us around the sun faster. The combination of speeds makes Mars appear to move more slowly than we might think. This Red Planet moves at about half the speed of our planet so Mars appears to slowly move across the sky as compared to the other planets. Mars was directly behind the sun on February 4 and has slowly emerged from the sun’s glare since then. While Jupiter revolves more slowly than Mars, our planet catches it sooner than it catches Mars. Its annual progression across our night sky is very similar to the stars. After conjunction, it appears in the morning sky, rising earlier each week. After several weeks, it rises around midnight. Then it rises around sunset as Earth passes between Jupiter and the sun. From that point it rises sooner each day. Before you know it, it appears in west just after sunset, shortly thereafter disappearing in the sun’s brilliant glare only to repeat the cycle. However, there is one small difference, Jupiter’s slight orbital motion carries it slightly eastward as compared to the stars during this sequence. So that in nearly 12 years, Jupiter has moved eastward on full circle in front of the stars behind the plane of the solar system, commonly known as the zodiac. As Mercury and Venus disappear into the sun’s glare after this display, Jupiter will rise rapidly in the morning sky when weekly observations are made. In comparison, Mars will not appear to move much as its orbital motion is only half our planet’s speed. 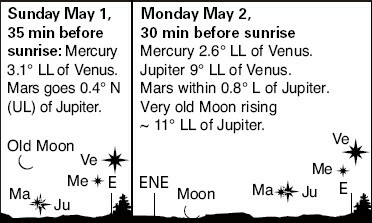 For example, compare Jupiter’s position near the horizon in the May 1 diagram above and then again in the May 22 diagram below. The chart below shows the relative position of the five planets and the sun on May 15, 2011, as viewed from north of the solar system. From Earth, all the planets appear nearly in a line. They are not easily observed because the line is near the brilliant sun. The planets’ relative positions, May 8-11, 2011. As the month progresses, Jupiter appears higher in the sky, Mercury and Venus appear lower, and Mars appears nearly in the same place. While all the planet clustering occurs in the morning sky, the moon appears near Saturn on the evenings of May 12-14. With the changing weather patterns and increased daylight, May 2011 brings an interesting clustering of planets in the bright predawn skies. Use binoculars or a telescope; be patient; and watch the changing display of planets. A note about the Abrams Planetarium Sky Calendar. The publication is an excellent way to learn about the sky. Written by expert sky watcher, Robert C. Victor, with an accompanying monthly sky map by D. David Batch, the Sky Calendar is written in calendar form that shows notable sky events that interested sky watchers can find. Victor uses the moon to help locate bright stars and planets. The calendar is published as a quarterly set, but subscriptions can start any time. Send $11 to Sky Calendar, Abrams Planetarium, Michigan State University, East Lansing, Michigan 48824. For purposes of full disclosure, this writer studied planetarium and astronomy education at Abrams Planetarium, and received a master’s degree in the subject from Michigan State University. At the time, we graduate students were informally called “Abrams Interns.” Graduates have served at planetariums and astronomy education organizations across the world. Victor, Batch and other Abrams staff schooled us in how to connect with the public on observational astronomy. If we former Interns were in another field, we would be praising our Abrams mentors in our resumes and our bios. It was an honor to study with them and to see what they continue to do with constant commitment and devotion to their field of communicating astronomy to the public. I received no compensation for this endorsement. TheSky Calendar is a worthy publication that needs our support. Subscribe today! Thank you, Dr. Hunt, for an excellent, easy-to-understand tutorial and fabulous blog–you do your mentors proud with the wonderful way you communicate astronomy to the public. I will definitely share your blog link with my family and friends, especially on Facebook where there are many astronomy buffs who’ll benefit from the info you’re providing. Well done and thank you!